by Adventure Photo Tours Inc.
Tour Includes: Lunch, Unlimited Bottled Water & Snacks. 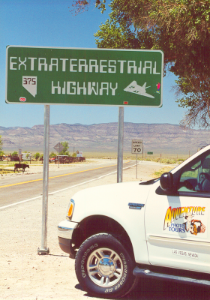 The route to Area 51 is some of the most incredibly scenic in the world. On the edge of an ancient dry lake we view very unusual Indian Petroglyphs that resemble aliens; we then explore this mysterious dry lake where recent sightings of UFO's have been observed. After another beautiful drive along the “Extraterrestrial Highway” we arrive at the famous Little A'le' Inn. This location has been the host of numerous documentaries and movies including "Independence Day." Here you will find a wealth of information and souvenirs on this top-secret area. Captain Chuck Clark, an ex-air force captain, has written a manual on Area 51, which is also available for purchase. After a great Alien Burger at the Little A'le' Inn we journey to the infamous Black Mailbox, a sacred meeting place for UFO enthusiasts. We arrive at the absolute perimeter of Area 51 through a strange and deformed Joshua Tree forest where the guards (The Men In Black) forever stand watch along with detection devices, listening devices and cameras mounted among the cactus. The signs read, "Top Secret Military Facility, Keep Out, Use of Deadly force Authorized". It's very spooky. This is an Extreme Tour to the world's most top secret military facility; home to the real X files. We are an Independent business and not part of Little A'Le'Inn. Please contact us with any questions, concerns or issues you may have.